Today I logged in to my 401k account, which I hadn't checked for about a year. 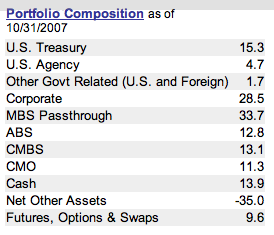 See that there "MBS Passthrough," where I have 34 percent of my bond money? Those are Mortgage Backed Securities. And CMBS? That means "Commercial Mortgage-Backed Securities." And CMO? "Collateralized Mortgage Obligations." In total, nearly 60 percent of my bond money is exposed to the mortgage market. The CMBS and CMO categories are the most worrisome to me, because as I have written and blogged and read (and read and read and read), huge chunks of those markets have turned illiquid. In other words, it is hard to sell these securities, because it is hard to find buyers. And it is hard to find buyers because people realize the ratings assigned to many bonds by Moody's, S&P and Finch were simply wrong -- there was far more risk hiding in certain types of debt security than was reflected in the ratings. The short version: the bond market is broken. And now the government is expected to intervene. Do you want to be invested in a broken market where, when you go to sell your bonds, it may be impossible to find a buyer? Do you want to be in a market where the government is about to rewrite all the rules? When you opted to put some of your 401k in bonds, did you do so to increase the risk and volatility in your portfolio, or did you have the opposite in mind? For most people, the bond portion of the 401k is intended to provide lower risk and volatility than the stock market, along with diversification -- returns not correlated with the stock market. Heavy exposure to mortgage backed securities undermines these goals. Your bond fund probably looks a lot like mine, since my bond fund is designed to mimmick the entire bond market. Check your 401k and reevaluate your bond holdings and whether to reduce them. I personally sold half my bonds, reducing bonds to 15 percent of my 401k.